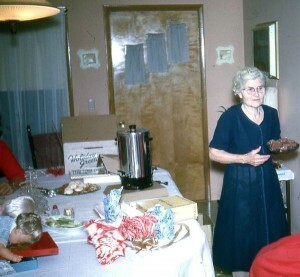 Christmas dinner at the Cornelius & Hilda Schumm home, c1963. Some of the best holiday memories come from family get-togethers. 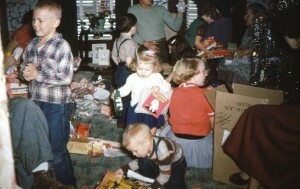 When I was young we went to each of my grandparents’ homes for a Christmas celebration. 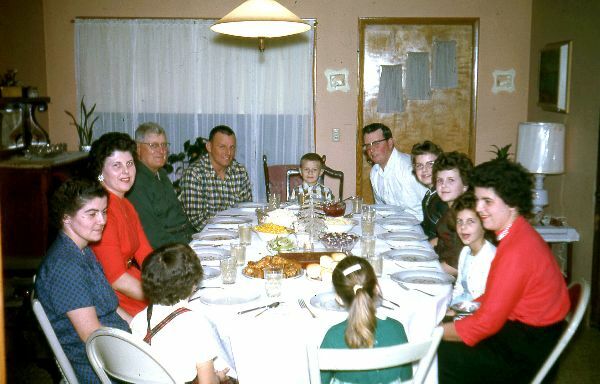 The Schumms usually gathered for an evening meal sometime between Christmas and New Year’s Day. 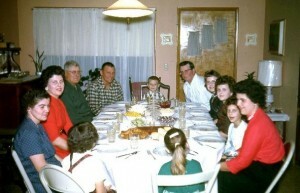 We were all able to sit around their dining room table, which was set with Grandma’s good china. Grandma and Grandpa had an old round oak table and they put all the leaves in it for the Christmas dinner. About thirteen of us were able to sit and eat at the table. Grandma was usually too busy serving to sit and eat with us. Grandma Schumm fixed most of meal herself, but I think my aunt Amy may have helped her a little. We usually had beef for our holiday meal. Come to think if it, I don’t think Grandpa would eat chicken. Grandma always had corn and she made a delicious pineapple pie. I wish I had that pineapple pie recipe. After the meal Grandma would always pass around a dish of chocolates. Sometimes she served white wine in pretty little wine glasses on a silver tray. These were festive and rather fancy events. 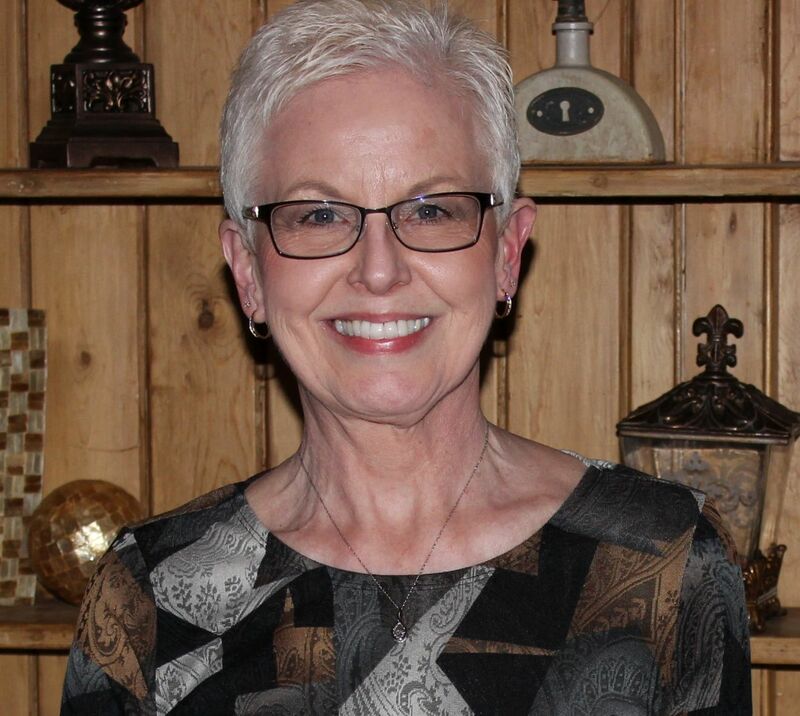 I still have the pair of garnet pierced earrings that Grandma Schumm gave me one year as a Christmas present. Grandma Schumm (Hilda) passing the chocolates around. As I recall, the Millers usually got together in the afternoon for their Christmas dinner and gift exchange. There were a lot of people in that little house. There was no way we could all sit at one table there. There were card tables set up in just about every room. 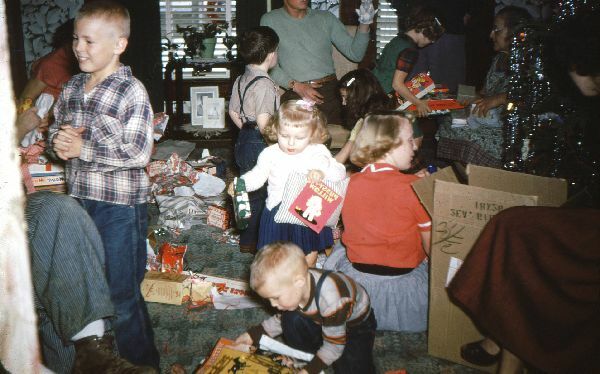 I remember that Grandma Miller often gave us younger kids the BIG box of 64 Crayola Crayons and a coloring book. I always looked forward to getting that new box of crayons. It looks like I got a story book in the photo below. Christmas at the Carl & Gertrude Miller home, c1953. 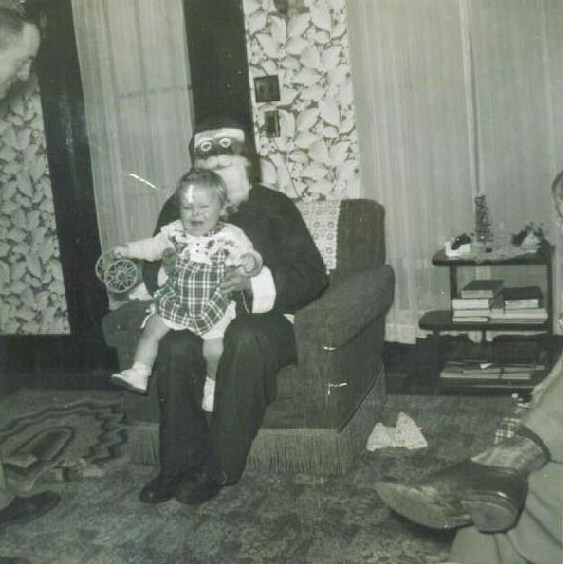 I was too young to remember sitting on scary Santa’s lap at my first Miller Christmas. I have been told that was the day I fell and hit my head on the corner of the sofa and had to get several stitches. I still have the scar on my forehead. No wonder I was crying. I probably had one major headache. Looking at those old photos, it appears that Santa was very good to both families.